One hundred and fifty years into the future, mankind has mastered genetic engineering and populated the planets of Mars and Venus (the "Homeworlds") by modifying the atmospheres of those planets to allow for human habitation. Military force was becoming of much less importance until attacks on space shipping by outlaw Pirates (former inmates of penal colonies on the outer planets) increased with alarming frequency. The Homeworlds Congress organized a new military force to deal with the Pirate menace: the Exoforce. Using sophisticated "Exo-technology" (powerful armored suits that function as impenetrable outer skeletons) these brave men and women do battle with the Pirates. Meanwhile, scientists continued to experiment with the human genetic code creating "the next phase of human evolution". This new "race" was called Neosapien. The Neosapiens possess an incredible intellect, need no sleep and very little nourishment; they are a perfect work force for the still harsh environments of Mars and Venus. The Neosapiens are deliberately subjugated by "natural" humans who fear their superior abilities in almost all areas. Neosapiens are very resentful of their role as second class citizens and soon are galvanized behind a charismatic leader, Phaeton. He insisted ominously that Neosapiens were the ultimate expression of intelligent life in the Universe and destined to rule all mankind. Phaeton soon planned and launched a brutal surprise attack upon the Homeworlds, and quickly conquered them while the Exoforce was occupied with the Pirates. Shortly Phaeton has complete control over the Homeworlds, and begins his plans to subjugate, and eventually eliminate all natural humans. Only the Exoforce can defeat Phaeton and put a stop to his mad vision. Our stories will focus on Able Squad, a group of courageous young people (Natural Human and Neosapien) who are dedicated to bringing an end to Phaeton's tyranny. Led by Lt. J.T. Marsh, the ExoSquad battles Phaeton and his henchmen in an effort to free humanity so that all may live in equality and peace. 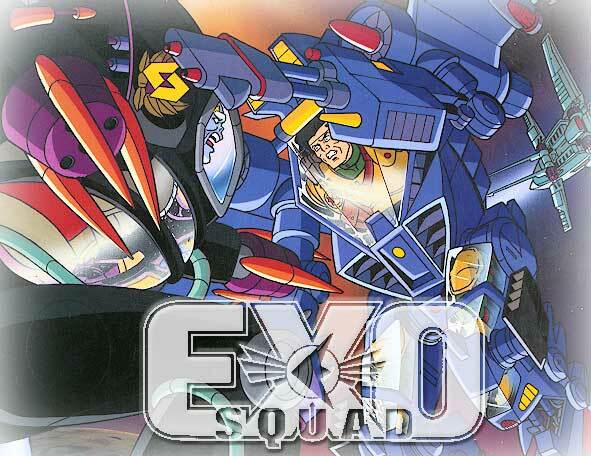 The second season of exosquad follows the continuing adventures of Commander J.T. Marsh and Able Squad as they battle for human liberation from the Neosapein tyranny of Phaeton. Our heros first strike an unusual alliance between the Exofleet and its longtime enemies, the Tethysian Pirates. With the help of the Pirate leader, Simbacca, J.T. and the daring Exofleet make a last stand against Phaeton. On Earth and Venus, organized resistance groups harass the Neosapien occupation forces, and carry out many missions with the help of Able Squad. The Exofleet will score a series of small but decisive victories against Phaeton, infuriating him. Phaeton is unable to accept even the smallest failure, and ruthlessly takes revenge on his own Generals. For Phaeton, as with all tyrants, his own arrogance will prove to be his downfall.